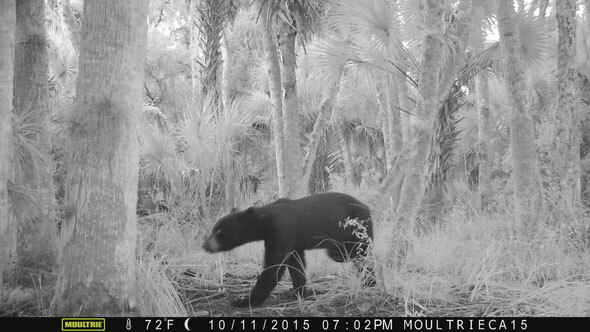 FIRST EVER--On Oct. 11, 2015, Sarasota County volunteers captured in a game camera (one of several purchased by Friends of the Carlton Reserve) a Florida black bear in the T. Mabry Carlton, Jr. Memorial Reserve (CMR). Donna Day and Ernie Winn, routinely checking a monitoring camera, were pleasantly shocked/surprised to find this image. 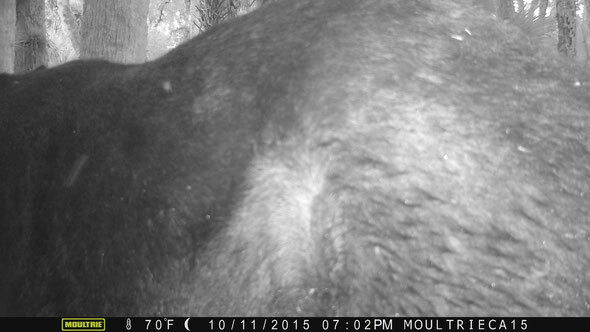 A moment earlier he/she appears to be rubbing against the tree on which the camera was mounted either to scratch or to check out the camera for possible snacks. Hunting is allowed on nearly 6 million acres of public land in Florida (federal and state managed) which accounts for 66% of all public lands in the State. Sarasota County voters approved a referendum whose wording includes a "Statement of Environmental Commitment," signed by T. Mabry Carlton , Jr., chairman of the Sarasota County Board of County Commissioners. It legally establishes that the CMR, except for the County's primary water supply and treatment site, will be reserved for open space and recreational activities that are "non-consumptive, ecologically benign and resource based."